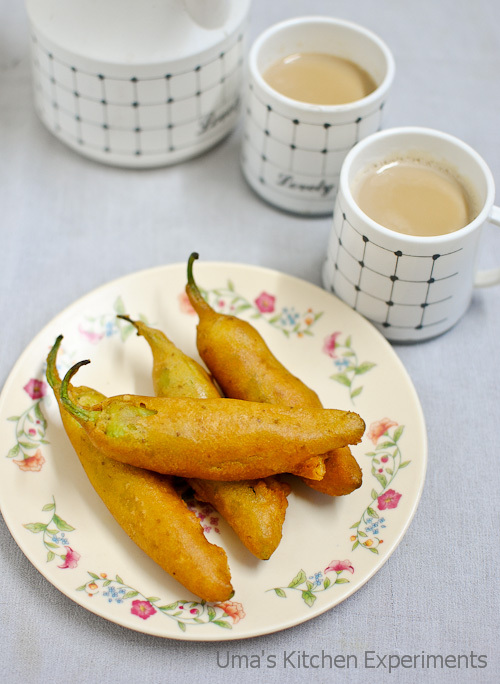 The very first thought of having Stuffed Bajji's on a rainy evening sounds awesome. One can prepare Bajjis using Onions, Potatoes etc. 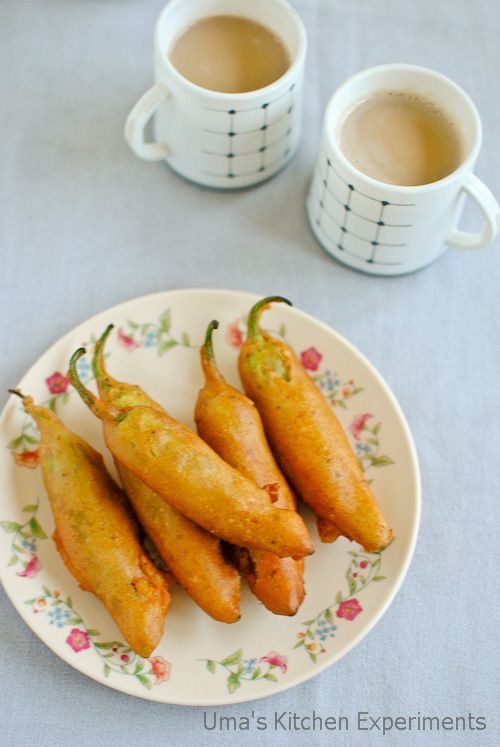 This stuffed bajji / Milaga bajji as it is called in Tamil is prepared from Jalapenos. Jalapenos is a kind of chili which is less hotter in taste than the normal chilies used in cooking. For this reason it is widely used for preparing Milaga bajjis. The original name of this chili is Anaheium pepper which traces its origins from California. Anaheium Pepper / Jalapenos / Bajji milagai -12 nos. 1) Wash the potatoes and pressure cook them. 2) When pressure subsides, take out the potatoes and peel their skin. 3) Mash them well using a steel masher or by hand. 4) Add cumin seeds, salt, red chilli powder, turmeric powder and asafoetida. 5) Mix well. Make sure you do not see any lumps of potato. 6) Once the Stuffing is ready, keep it aside. 1) In a mixing bowl, add besan, rice flour, red chili powder and salt. 2) Make a paste of cumin seeds and garlic. If required add little water. Add to the mixing bowl. 3) Slowly add water and prepare thick batter. It is enough to prepare a batter which is of medium thickness. 4) Now, take the jalapenos and wash them well. Then, wipe them using a clean towel. 5) Slice the Jalapenos in a vertical (lengthwise fashion) from the twig to the tail of it as shown in the picture. 6) If required, remove the seeds from the Jalapenos gently. 7) Stuff the potato mixture inside the sliced Jalapenos using a spoon. Once it is stuffed, keep it aside. Repeat this step for the remaining Jalapenos. 8) Heat oil in a wide pan and add oil for deep frying. 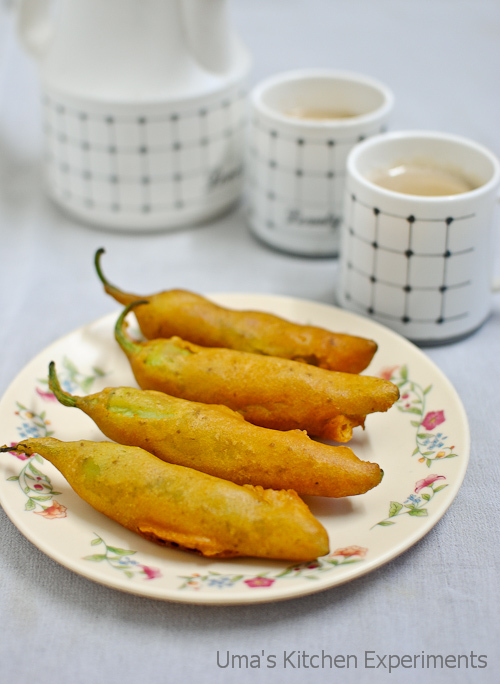 9) When oil is hot, dip the stuffed jalapenos in the besan and fry them in oil. 10) When the stuffed Jalapenos are fried well, remove them from oil and transfer to a plate covered with kitchen towel. Serve with chutney or sauce. We enjoyed it with hot tea. I have tasted it and it is spicy and yummy. Don't you want to try this simple dish at your home? I am sure, you will. 1) You can also use instant bajji mix for making this bajji. 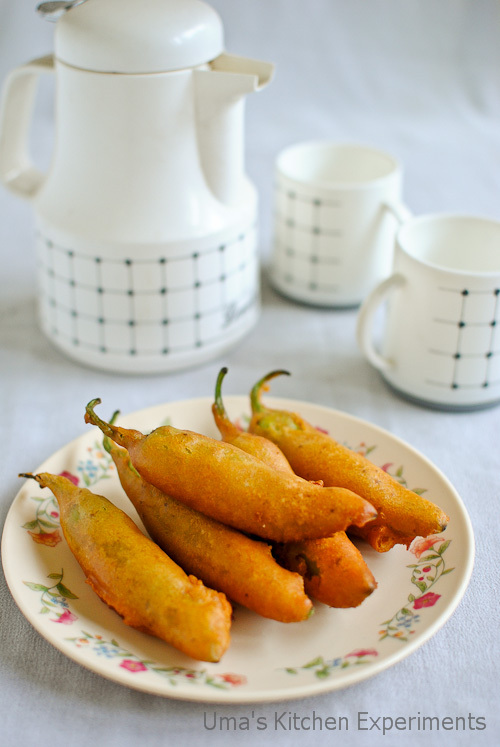 2) If you run out of time, simply dip the chillis into the batter and deep fry in oil. Skip the stuffing part. 3) You can also saute the stuffing, if required.